Tommasso Debenedetti has become skilled in tricking everyone on the internet. And by “everyone,” we mean everyone. Debenedetti started his campaign of hoaxes in 2000 while working in the Italian newspaper industry. Over 60 newspaper interviews conducted by Debenedetti are believed to have been published. The New Yorker claims that Debenedetti’s supposed interview subjects included John Grisham, Desmond Tutu, Cardinal Ratzinger, Mikhail Gorbachev and even the Dalai Lama. If he sounds like an unusual man, that’s because he is. Massimiliano MalerbaTommasso Debenedetti’s father, journalist Antonio Debenedetti. 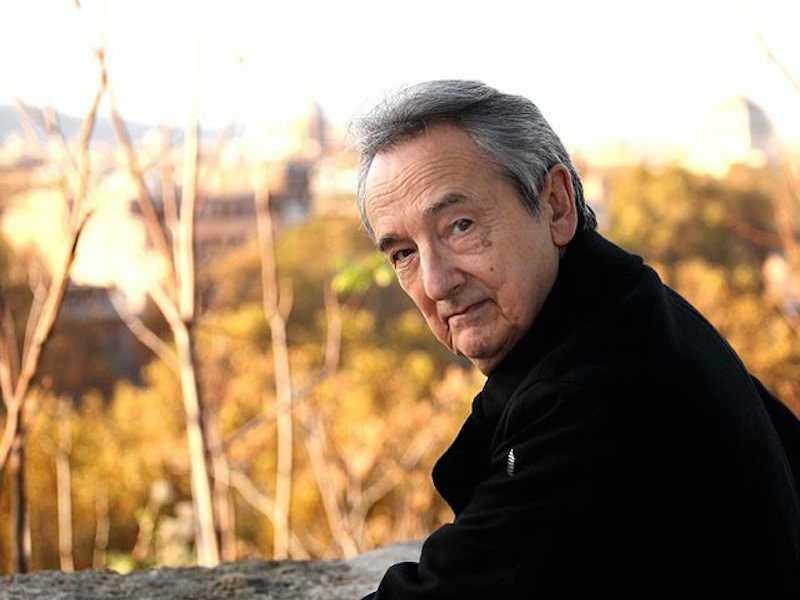 In a 2010 interview with Spanish newspaper El País, Debenedetti claimed to be a father of two and a professor of Italian history who works at a public school in central Rome. He said he was born in Rome in 1969, the son and grandson of two famous journalists. His father is reportedly Antonio Debenedetti, an author, poet and literary critic. In a 2010 interview with the New Yorker, Debenedetti claimed to have fallen out with his father, saying “we don’t have a relationship.” His grandfather is writer, essayist and journalist Giacomo Debenedetti, the Italian writer known for his coverage of Jews living in Italy during the Second World War. But despite his family’s notable history, Debenedetti doesn’t intend to follow in their footsteps. “Italy is a joke,” Debenedetti said at the time of his exposure as a faker, explaining that he worked as a freelance writer selling fictitious interviews to conservative newspapers because they often published pieces without fact-checking them first. To learn the speaking style of the people he impersonated, he would carefully read their books. But Debenedetti was only just getting started. “I would like to be Italy’s champion of the lie,” he said in 2010 after being exposed. And sure enough, that’s exactly what he has gone on to do. After exhausting the opportunities offered to him by lazy newspaper editors, Debenedetti decided to use the internet as a new medium to spread hoax articles. He’s hit on a winning formula that can cause hoaxes to spread in seconds. The account started life as a “personal” account for Vladimir Putin, before changing to Edward Snowden days later. The Twitter archive site Bio Is Changed shows that it has also been used to impersonate the Prime Minister of Sweden, the Prime Minister of Denmark, as well as other Russian politicians. But is anyone actually falling for this tactic? Surprisingly, hundreds already have. Debenedetti’s current hoax account, shown above, includes a host of influential followers, thanks to his tactic of using the same account and simply changing the photo, name, and bio. When a story emerges on Twitter, one of the first steps for a journalist is to check the account’s followers. Other than Twitter’s verified tick, a surefire way to know if a political account is real is to see how many followers they have, and whether any respected journalists follow them. As well as journalists, Debenedetti’s hoax account is also followed by accounts belong to WikiLeaks, EU ministers, ambassadors, a Twitter employee and even official political party accounts. To people unfamiliar with Twitter, or to journalists who aren’t trained in verifying social media rumours, it’s easy to think that the account is real based on its followers. Because he communicates through his network of fake accounts, it’s impossible to verify that we spoke to the actual internet hoaxer Tommasso Debenedetti. However, his answers are certainly in line with interviews he has given in the past. News agencies such as AP, Reuters and big newspapers are able to verify news. But little newspapers, blogs and radio stations, are not able to verify, and so regularly accept rumours and fake news. The problem is the situation of social media, and generally of the web. I’m sure I’ll continue. Despite Twitter’s verification process, it’s still easy for any devious user to quickly spread a rumour that has a global impact. One of Debenedetti’s most successful hoaxes took place in August 2012. 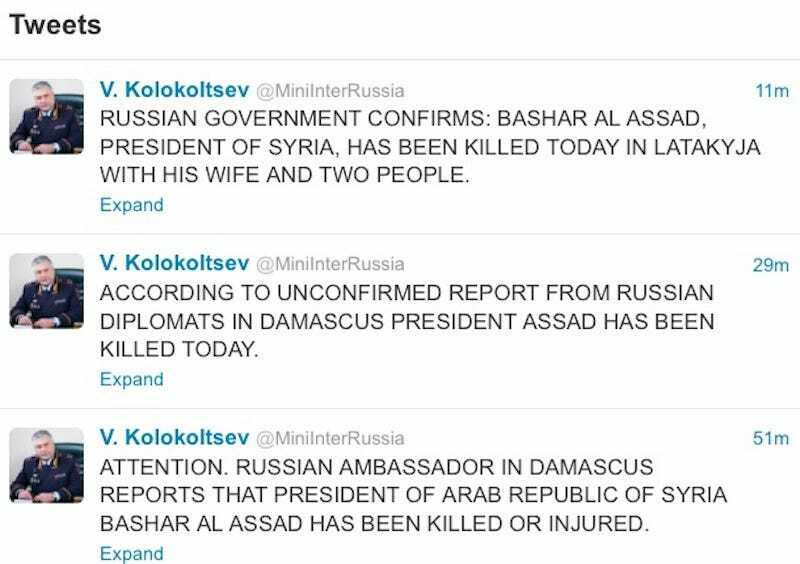 He created a fake Twitter account to impersonate Russian interior minister Vladimir Kolokoltsev, and proceeded to tweet out an all-caps message saying that Syrian president Bashar al-Assad and his wife had been killed. 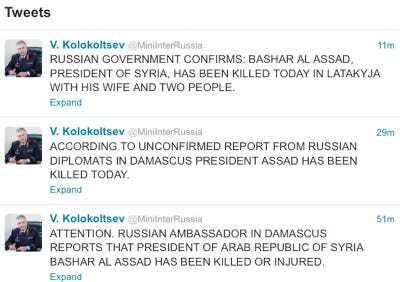 The hoax progressed like a real breaking news story, starting as a claim that Assad had been injured, before new “developments” emerged. But what was unusual about this hoax was its impact. 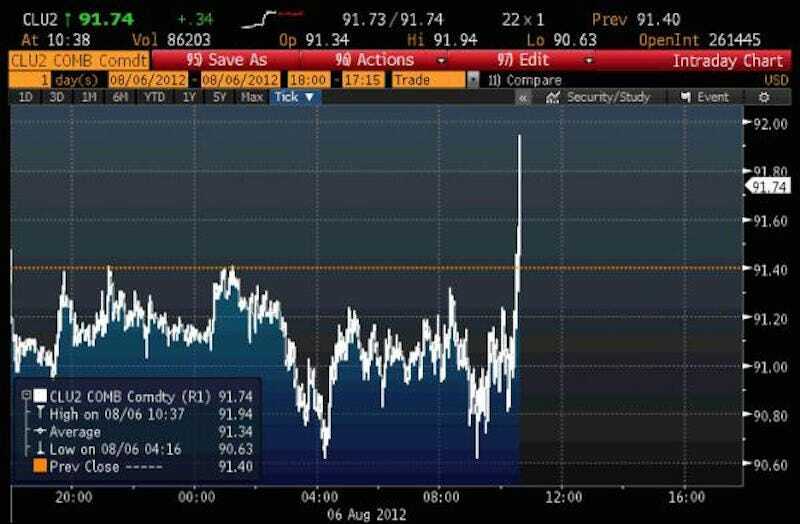 Zero Hedge reports that minutes after the tweets were sent, traders began to take notice. The price of crude oil soared as the financial world worried about Syria’s political future and the availability of oil. Unlike his series of newspaper hoaxes, which Debenedetti claims were written in the evenings after he returned from his job as a teacher, his Twitter antics are often worked into his lessons. Last year I created a fake Twitter account with my students, using the school’s PC. The students and the school’s director were all enthusiasts. And the account, I can say, was very well-followed, and some news sources quoted it.